Utah and specifically Salt Lake is widely known as the religious center for the Church of Jesus Christ of Latter Day Saints, commonly known as the Mormon church. In the heart of downtown is Temple Square where thousands of visitors each year make their way. Perhaps lesser known and visited yet impressive in its own scale is the Cathedral of the Madeleine located at 331 E. South Temple. 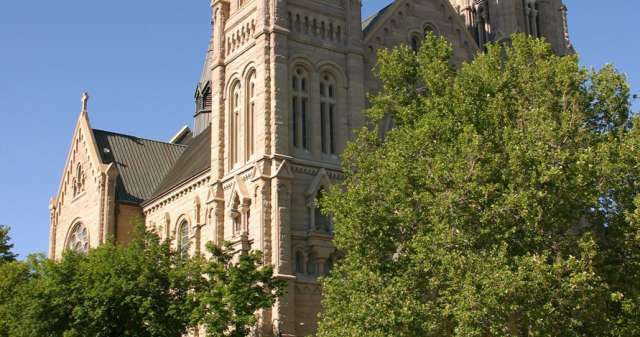 As a Utah and Nationally listed historical location if you&apos;ve found yourself in Salt Lake and are looking to see unique architecture the Cathedral makes for a memorable visit, especially if there is a concert as there commonly can be. As one of the stops on the Connect Pass City Tour, the Cathedral of the Madeleine is combined of a predominantly Romanesque exterior with a Gothic interior on the structure. The stained glass is some of the finest in Utah and reminiscent of locations I&apos;ve seen throughout Europe. I first experienced the Cathedral when listening to a coral group and orchestra perform a Christmas concert there a few years ago. The acoustics along with the ambiance was something I&apos;ll not soon forget. Forever etched in my mind are the inspiring sounds of the orchestra as it brought to life this aged edifice. This coming year the Cathedral will celebrate it&apos;s 100 year anniversary and during the annual Madeleine Festival the Mormon Tabernacle Choir will perform 2 nights. Tickets won&apos;t be available until January 2, 2009 but it&apos;s something that will be memorable if you&apos;re able to attend. If you&apos;d like to see the Catheral, it&apos;s open for worship each day but on Sunday&apos;s at 12:30 there is a free public tour.